Walking along Kimberley's Main Street today you might think it to be largely Victorian, overlain with a rather uninspiring mix of modern development and traffic problems. The history of Kimberley, however, is altogether more interesting. It arose, probably, as a Saxon settlement, and first saw the light of day in records as an entry in the Domesday survey of 1087. For centuries it remained remote and obscure, with few inhabitants, pursuing the remorseless agricultural grind of early times. As the medieval period progressed, Kimberley acquired and lost great landowners, some of them in dramatic circumstances. William Peverel was probably the mightiest, but there were others, including the Duke of Rutland, Lord Melbourne, and the Earls of Essex. The agricultural pace of life changed little over the centuries. By about 1800, however, there were subtle but important breaks with the past. The system of large, communal fields had all but disappeared; the turnpike road had arrived and transport had started to improve. In 1800 the age of railways was yet to dawn, but the Nottingham Canal had reached the fringes of the area, and mining, for centuries an isolated and local activity, had taken its first steps towards operations on an industrial scale. 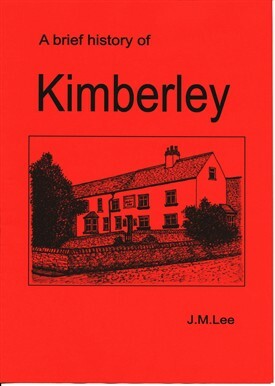 Kimberley had arrived at the beginning of the Industrial Revolution. Mining, canals, lace, brick-making, religion, beer and railways, all made heavy inroads. The population mushroomed, poverty and early death were rife, fortunes were made and lost. Kimberley, despite its small size, acquired two competing railways, two competing railway stations, a famously dangerous tramway, a legendary number of beerhouses, many vociferous churches and two large breweries. This small booklet has been considerably updated and revised for 2013. It contains a good deal of recent research, together with additional maps and more detail. It also includes material previously not covered, notably a brief consideration of Babbington. This page was added by John Lee on 03/03/2013.